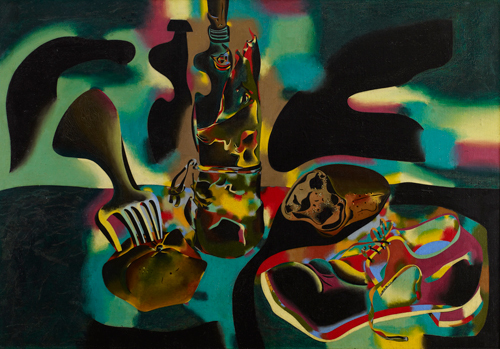 Inscribed on stretcher: Joan Miró / Nature Morte au Vieux Soulier / 24-I-29-V-1937. S. Takiguchi, Miró, Atelier, Tokio 1940, p. 45. J.J. Sweeney, Joan Miró, The Museum of Modern Art, New York 1941, p. 68. A. Cirici Pellicer, Miró y la imaginación, Omega, Barcelona 1949, no. 46. J.T. Soby, Joan Miró, The Museum of Modern Art, New York 1959, p. 89 (col). J. Dupin, Miró, Flammarion, Paris 1961, no. 473, p. 267 (col). Y. Bonnefoy, Miró, Bibliothèque des Arts, Paris 1964, no. 36 (col). M. Gasser, Joan Miró, Barnes & Noble, New York 1965, p. 57 (col). A. Cirici Pellicer, Miró en su obra, Editorial Labor, Barcelona 1970, no. 23, p. 85. J.J. Sweeney, Joan Miró, Polígrafa, Barcelona 1970, p. 89 (col). M. Tapié, Joan Miró, Fratelli Fabbri, Milan 1970, no. 50 (col). G. Diehl, Miró, Flammarion, Paris 1974, p. 61 (col). M. Rowell, Joan Miró, Peinture = poésie, La Différence, Paris 1976, p. 70. A. Cirici, Miró-Mirall, Polígrafa, Barcelona 1977, no. 24, p. 37 (col). P. Gimferrer, Miró, colpir sense nafrar, Polígrafa, Barcelona 1978, no. 149, p. 159 (col). R.M. Malet, Joan Miró, Polígrafa, Barcelona 1983, no. 51 (col). G. Weelen, Miró, Nouvelles Éditions Françaises, Paris 1984, no. 147, p. 109 (col). A. Jouffroy, Miró, Hazan, Paris 1987, p. 67 (col). W. Erben, Joan Miró, Benedikt Taschen, Cologne 1988, p. 83 (col). R. Penrose, Joan Miró, Thames and Hudson, Paris 1990, no. 60, p. 87 (col). J. Dupin, Miró, Flammarion, Paris 1993, no. 227, p. 207 (col). J. Punyet Miró, G. Lolivier, Miró. Le peintre aux étoiles, Découvertes Gallimard, Paris 1993, p. 59 (col). V. Combalía, Picasso-Miró. Miradas cruzadas, Electa, Madrid 1998, fig. 43, p. 61. 1941. New York, The Museum of Modern Art, no cat. number. 1959. New York, The Museum of Modern Art, cat. no. 65. Los Angeles, The Los Angeles County Museum, cat. no. 64. 1962. Paris, Musée National d'Art Moderne, cat. no. 69. 1964. London, The Tate Gallery ‒ Zurich, Kunsthaus, cat. no. 147, repr. pl. 28a. cat. no. 57, repr. p. 59 (col). 1968. Saint-Paul, Fondation Maeght, cat. no. 32, repr. (col). Barcelona, Antic Hospital de la Santa Creu, cat. no. 37, repr. p. 28 (col). 1973. New York, The Museum of Modern Art: "Miró in the collection of the Museum of Modern Art,"
cat. repr. p. 73 (col). 1978. London, The Tate Gallery: "Dada and Surrealism Reviewed," cat. no. 12.97, repr. (col). 1980. Washington D.C., Hirshhorn Museum and Sculpture Garden, Smithsonian Institution ‒ Buffalo, Albright-Knox Art Gallery, cat. no. 26, repr. p. 75 (col). 1982. Houston, The Museum of Fine Arts: "Miró in America," cat. no. 19 repr. (col). 1986. Zurich, Kunsthaus ‒ Düsseldorf, Kunsthalle, cat. no. 101, repr. (col). 1987. New York, The Solomon R. Guggenheim Museum, cat. no. 86, repr. p. 165 (col). 1988. Barcelona, Fundació Joan Miró: "Impactes. Joan Miró 1929-1941," cat. no. 57, repr. p. 89 (col). 1993. Barcelona, Fundació Joan Miró, cat. no. 146, repr. p. 341 (col). New York, The Museum of Modern Art, cat. no. 145, repr. p. 227 (col). 1998. Stockholm, Moderna Museet: "Joan Miró. Creator of new worlds," cat. no. 47, repr. p. 31 (col). Mr. and Mrs. Earle C. Miller, Downington, Pa.